You must have sighed in amazement by seeing all the grace and beauty of gorgeous peacocks for sure. For this reason, we have designed our amazingly alluring peacock wedding invitations just for you. Designed and crafted with passion and love, these gorgeous peacock style wedding invites are something you must have never seen before and you will simply embrace the charm of these amazing peacock wedding cards. All the peacock wedding cads at 123WeddingCards have rich colors of peacock feathers in them and the rich color of peacock feathers assures your wedding guests that the wedding affair would be a rich and grand affair. The unbridled joy of these peacock style wedding invites makes them one of the best invitations for your wedding. 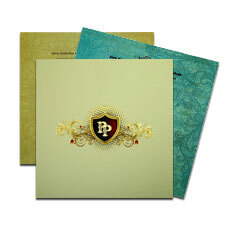 The auspiciousness of peacock themed wedding cards make adds more charm and beauty to your wedding affair. 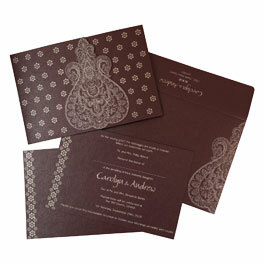 Moreover, you will find a various variety of paper and colors of beautiful paisley pattern wedding invitations at 123WeddingCards to choose from. Along with this, we also offer the tool of customization especially for our charming customers that allow you to personalize your invitations for weddings. With the help of this tool, you can select your own wedding wordings, paper variety, color and a lot more. The charm of our wedding invitations will make you fall in love with them.